After a successful debut at Francis, James Ward, Asher Goldstein, and Simone Sammuri, the trio who won the T.Dining 2019 Restaurateurs Of The Year award are back with their sophomore establishment. Strayed away from the quieter St Francis Street, the trio presented Mr Brown, their new grill house concept on the busy Ship Street, neighbouring Motorino, Bo Innovation, and 22 Ships. The ground floor space was an understated entrance, where wooden panels lined alternately against one another, revealing tanned glass that allowed a glimpse of the lengthy stretch of a dining space. Guests are greeted at the well-stocked bar, followed by a long kitchen bar seating opposite evenly spaced tables from the other side. The raised platform booths at the deep end of the restaurant may offer more privacy for small parties, we believe the kitchen bar offers the best seat in the house with live cooking and plating action throughout the night. Staying true to the success of Francis’ small-plate starters and sharing main courses, Mr Brown’s menu works in a similar fashion, where guests can enjoy a few snacks, followed by a generous selection of grilled meats as main courses, as well as vegetable dishes and desserts. We started our meal with corn and buttermilk fritters, fermented chillies and mahon cheese. These tiny globes of fritters were golden and sweet. A generous helping of shaved mahon cheese offered a savoury touch, offset by the sharp heat of fermented chilli mayonnaise. Iberico pork muffin with cabbage, aioli and mustard were petite but surprisingly filling. Tiny rounds of sourdough English muffins were made in house, followed by mounting ribbons of Iberico pork neck, dressed nicely with aioli. These sliders may look miniature, but they were rather mealy and best shared. Even though Mr Brown’s main courses come in large portions, we were delighted to notice a half-portion option for its signature 14-hour smoked brisket with peppercorn and pickled onions. Served with the house-made barbecue sauce, the rich cut of beef was smoked slowly over 14 hours, cooked until the juices stayed within and the thin slices of brisket remained succulent and rich, while zingy pickled onions cut through the richness of the dish. The half smoked duck, pomegranate and fennel pollen was a show-stopping main. A generous half the roasted bird, carved bone-in, resembled one from Chinese barbecue stands. One should not be alarmed at the dark, almost burnt exterior. 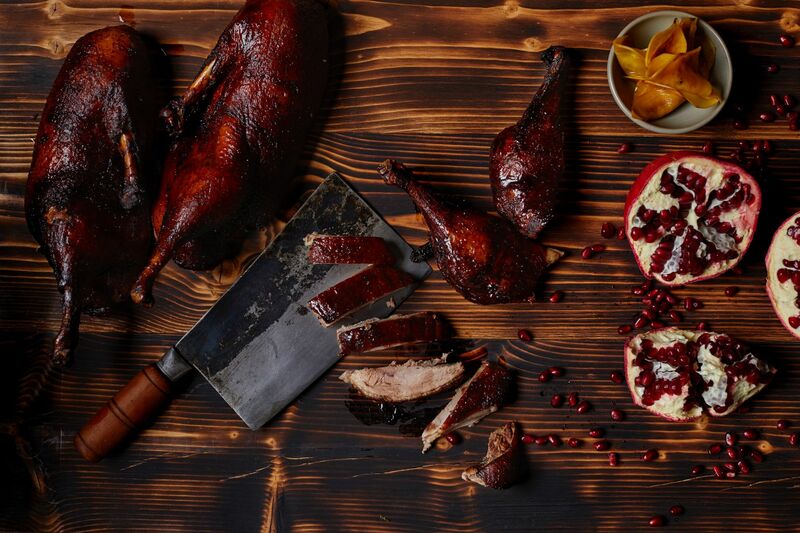 Sweet-and-sour pomegranate molasses has been added to baste the bird, allowing the sugar to caramelised while mellowing the gaminess of the duck flesh. Fennel pollen added a hint of floral sweetness that went well with the savoury barbecue sauce. Grilled cabbage with sesame and horseradish made a wonderful vegetable side dish, the charred cabbage wedges were smoky and sweet, while fresh horseradish grated right before serving gave the side dish a kick on the palate. With only three desserts on offer, we were particularly impressed with the cheesecake with Persian lime and cherry sorbet. A simple, no-fuss dessert on its own, the baked cheesecake was creamy and ethereal, while the top and side was beautifully browned while the interior stayed soft, almost resembling a soufflé. The cherry sorbet was sharp and tangy, a great accompaniment to the creamy cheese dessert. Mr Brown stays true to its nature as a neighbourhood grill house, offering five craft beers on tap and a handful of wines by the glass, as well as bottles of wines from small producers from different regions of both old and new world. Cocktails are also popular at Mr Brown, especially The Roots, where mezcal infused with taro root was mixed with grapefruit juice and soda to create a smoky yet fruity concoction, a great pairing with grilled meats. Service is warm and attentive at Mr Brown, despite its casual nature. Members of the service team are keen and knowledgeable on the restaurant’s concept, food and drink offerings and particularly keen on offering recommendations and portion control. The level of alertness remains high when the restaurant was full as well. Mr Brown proves that dining concepts need not be too complex or avant-garde to win over its guests. Sometimes all you need are casual vibes, a good grill, and some great meats to tide our returns.